It’s hard to believe Spring Market time is here and we can’t wait to see you again. Stop by Booth #1732 (that’s Bosal’s) to say hello, see our latest patterns and take advantage of the Show Special. My Pals Bow-Wowz, Meowzz, Moozz & Neighzzz join the other “Critters” from BarnYard Petz and Zoo Pals to make mug rugs everyone will love. And by the way, any of our “Critters” make great in-shop classes. Plus, (and this is a big one) as with all our patterns these are Eazy and fun to make. Shops are already using all the mug rug "Critters" for classes. 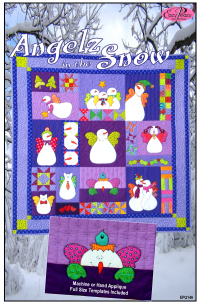 Also take a look at our latest quilt pattern Anglez in the Snow. Whimsical characters with angel wings - a perfect winter wall hanging and BOM! Finally, please attend our Schoolhouse session on a topic you won't want to miss. It's entitled “Out of Sight--Not Out of Mind” Thursday afternoon at 3:10 pm. We promise lots of door prizes!